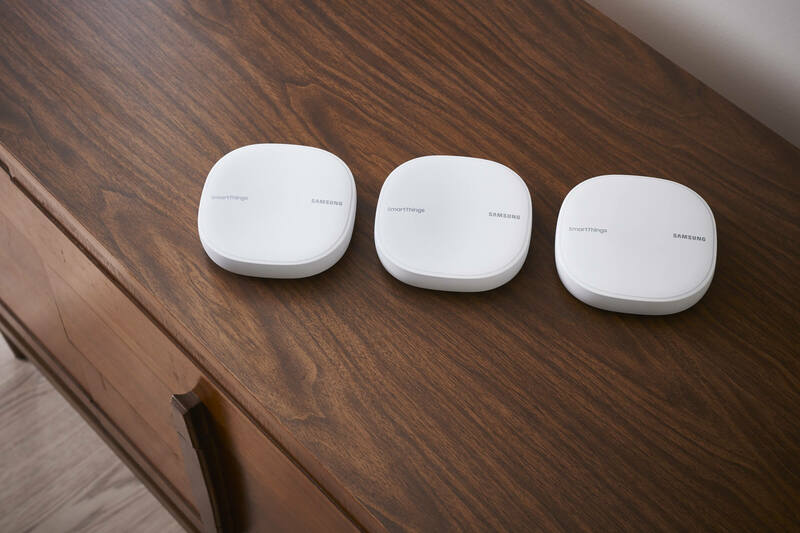 Something to look forward to: Samsung refreshes its SmartThings mesh wireless router with Plume's mesh networking technology. This combined with the built-in SmartThings hub should prove to be a good value for those interested in entering the smart-home market. Samsung technically isn't new to the mesh Wi-Fi world. It released its first SmartThings router last year to compete with the likes of Eero, Google WiFi, and Plume. This time however, Samsung decided that if you can't beat them, join them. The company's second version of their SmartThings router is called SmartThings WiFi and includes Plume's WiFi mesh networking technology. Like most of the other mesh networking platforms, the router is sold either in single packs or a three-pack to be scattered throughout your house to provide better wireless coverage. The major differentiation between the other platforms is that Samsung's router also doubles as a SmartThings hub. The hub feature allows you to configure multiple smart-home devices that utilize Z-Wave and Zigbee wireless protocols such as smart plugs, switches, lights, and cameras. If you already have a satisfactory WiFi solution in your home and don't want to buy Samsung's router, you can still buy the standalone SmartThings hub. It also has been refreshed with the ability to connect wirelessly to your home router. Previously, you had to plug the hub directly into the router via Ethernet. This should allow greater flexibility in where to place the hub for maximum smart-home efficiency. Finally, Samsung updated its various sensors that detect everything from motion, temperature, and leaks as well as its smart-plugs. The SmartThings WiFi router goes for $120 for the individual units or $280 for a pack of three. The updated SmartThings hub is priced at $70. The sensors and smart plug vary in price from $15 to $35. All of the devices go on sale today.